Convert a ratio to a fraction by entering part A and part B of the ratio. A ratio can be expressed as a fraction in a few different ways. A ratio can be a part-to-whole or a part-to-part ratio, and the methods for converting each are a little different. The calculator above will find both, and we’ll show you how it’s done. A part-to-whole ratio is an expression of the relationship between a subset and the entire set. For example, the proportion of peaches to all of the fruit in a basket can be expressed as a part-to-whole ratio. To convert a part-to-whole ratio to a fraction, simply rewrite the ratio as a fraction. Part A of the ratio is the numerator and part B is the denominator. The fraction can optionally be reduced after converting, if needed. For example, let’s convert 3:2 to a fraction. A part-to-part ratio is an expression of the relationship between two subsets of a set. For example, the proportion of peaches to oranges in a basket of only peaches and oranges can be expressed using a part-to-part ratio. 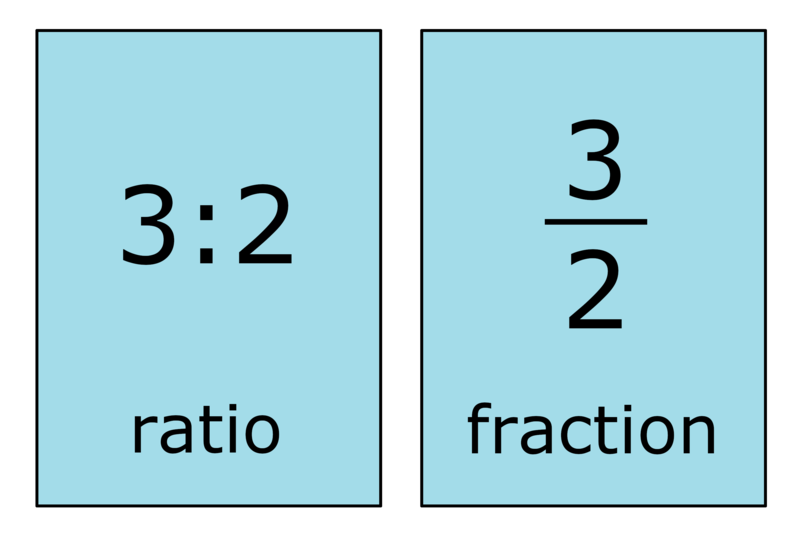 A part-to-part ratio is actually converted to two fractions, each equivalent to a part-to-whole ratio for each of the subsets. To convert, start by adding both parts of the ratio together. This will be the denominator for each of the fractions and also represents the whole set. Then, for each part of the ratio, create a fraction with the numerator being the first part of the ratio and the denominator being the sum that was just found. The result will be two fractions that represent the proportion of the subset to the whole set. For example, let’s convert the ratio of 1 peach to 3 oranges in a fruit basket, or 1:3, to fractions. Then, put each part of the ratio over the denominator to find the fractions. Thus, 14 of the fruit in the basket are peaches and 34 of the fruit in the basket are oranges. You might also find our fraction to ratio calculator useful.